Based in Montreal, Suitablee aims to be one of the leading providers of custom suits, tuxedos and dress shirts in Montreal. Suitablee internationally drop-ships to your door authentic custom-tailored suits and shirts designed with its unique online platform. Suitablee's customers are able to completely customize and design their suits and shirts online or in the comfort of their homes or office. Suitablee's expertise also extends to its scope of ties, bowties and other accessories which can be ordered online or in person. Customers also benefit from being able to book appointments with our mobile tailors at their home or office. Once there, our tailors showcase over 500 fabrics to choose from. From there, “You design. We tailor.” Our tailors serve as advisors for your outfit needed for work, a night out, or for your wedding. Suitablee also prides itself from its work with companies in tailoring company outfits that include embroidery. Beyond just providing a state-of-the-art buying experience, Suitablee prides itself in delivering products that are personally assembled with the care of its famous Suitablee Tailors based in Asia while its Montreal team puts the finishing touches to guarantee quality. Fabrics are of premium quality from the UK and Italy. 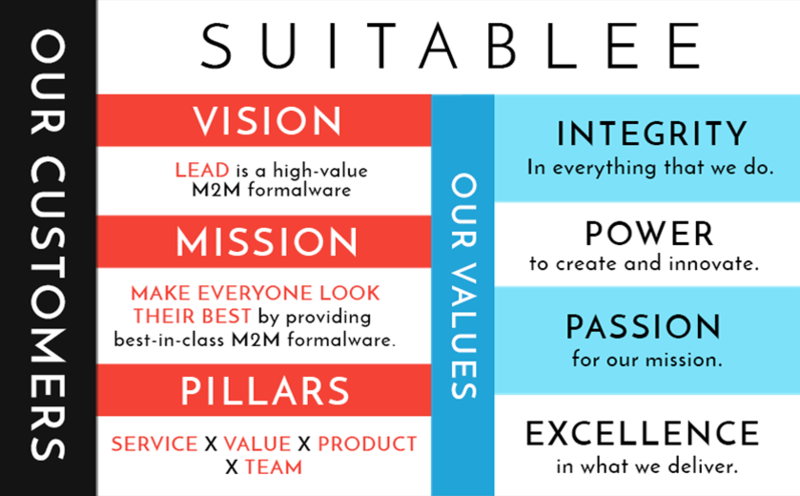 Suitablee is where fashion and technology breed excellence. At Suitablee, we are constantly on the lookout for the best talent. We laugh, we play, and we work. Most importantly, we have a purpose. Come and join us in this quest for purpose. E-Mail us your CV and let us know why you want to join our quest.